I have no control over the ads that Google AdSense place on my blog. Today Senator Patty Murray is supporting me. Don't click on her ad. Instead go to Dino Rossi's site and see what he has to offer Washington voters. It's a primary responsibility of Congress to write and pass the budget each year. But the Demo leadership in the House, where budgets must originate, say they will not do it this year. Majority Leader Steny Hoyer announced his bold lack of action this week. He said that Congress would pass a resolution calling for lower spending than Obama instead. That he can't do anything until Obama's fiscal commission reports in December. Uh, Mr. Hoyer, It's the budget for only one year. How does it help to wait six months until three months after the fiscal year has started? Politico There is no good reason and they know it. Last year's budget was $1.3 trillion in the red. What's next? They don't want to show how bad the budget situation is before the election. Tyler Durden at ZeroHedge.com observes that Obama's Director of OMB "Propeller head" Peter Orszag quit the day before the budget was to be released. He thinks it's for the same reason - the numbers are ugly. (Plus Orszag is desperately in favor of smashing the already broken promise of no tax increases for incomes less than $250k.) So ask Rep. Rick Larson and Rep. Jay Inslee and Rep. Adam Smith what they are doing instead of their responsibility to build the budget. And why. Soccor is going to be the next big spactator sport in the USA. Going to be... Real soon now... for the last 30 years. But it's not going to be. We Americans like real football; the English call it "gridiron." Where men slam into each other then get up and walk away like nothing happened. In futbol a prime skill is the fake injury. Someone brushes against you and you are trained in theatrics to writhe in pain as if you had been impaled. There are videos of fake injury after fake. Why is the US coach complaining about fake injuries? He must not be European enough. It's not for me and I don't think this FIFA World Cup will result in more futbol fans in the US. 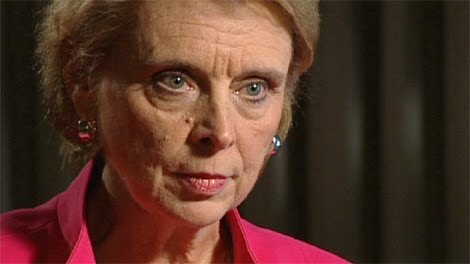 KING TV did a series on waste in the WSF system, but Christine Gregoire only heard about it; she didn't have time to watch it. Gregoire doesn't take time to watch the local news. Believe that! Waste: Employees are paid triple time. - Employees are paid to travel to and from work. Does Gregoire, not watching any of the series, acknowledge these and other problems? No! Not when asked by KING-5 reporter Susannah Frame. Gregoire responded about if they found anything illegal... (Clever, Gregoire, move the goal posts.) To which Frame responded that the threshold for the public is waste. Sources: MSNBC & Bryan Suits on KVI radio. The photo via MSNBC. While the White House really, really wants you believe that they have their boot on the neck of BP, it turns out that a key Administration official had his head inserted somewhere else just three short years ago. Do you think NOBEL LAUREATE (and Secretary of Energy) Steven Chu still thinks BP is going to help save the world? [video] This is one of the ironies of the disaster in the Gulf. From all available evidence, BP is as committed as anyone to the “comprehensive energy reform” agenda of the White House. No doubt this reflects both political realism and market opportunism on their part, but BP’s 2009 “Road Map for America’s Energy Future” could have been written by John Kerry. Higher energy prices, cap and trade? Bring it on, says BP. And this isn’t a recent shift on BP’s part. Here’s embattled BP Chairman Tony Hayward back in June 2007: From BP’s perspective, the evidence that climate change is happening, and that it is manmade, is mounting all the time. As the UN’s Intergovernmental Panel on Climate Change has found, the evidence is almost overwhelming. We could wait until the science is 100% certain, but BP believes that, as an energy company, it has a duty to act pre-emptively. When you balance the likely impacts of not taking action against the real opportunities that exist to take action, it is difficult to believe that humanity will not move towards a solution to climate change… We need to ensure that the costs of emissions of carbon dioxide and other greenhouse gases are included in the price we pay for everything – whether it be a television, a train journey, or switching on a light – all should reflect the cost of emissions in their price. This can be achieved through a Cap and Trade system, taxation, or regulation. Cheakamus Lake and River are the valley immediately south of Whistler Mountain and Musical Ridge, I think it's called, with Piccolo Peak, Flute Peak and Oboe Peak, then Singing Pass. Back in the car, driving down the road, two men were on the edge of the road with their cameras aimed at a tree near the road. I stopped and asked what they saw. They responded "Right there in the tree." I got out and looked: "huh?" "A bear." When he moved lots of branches moved; couldn't see him yet. The foliage was very thick. Then he broke a large branch off. Then I saw him. In the shadows on the gray day he looked pure black. I got a good look, but by the time I got my IPhone out he was out of sight. Not that the IPhone could have gotten a good photo. 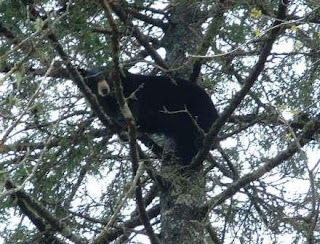 I have never before seen a bear in a tree. The photo is from Nova Scotia, found on the Internet. George Gilder is one of my heros. He has a long track record of first-class analysis and excellent communication. This is a trial with a link as an Amazon.com affiliate. Good news. The Demos can't handle making the playing field for companies, nonprofits and unions - the Citizens United case in the Supreme Court a few months ago ruled that Congress violated the Constitution in keeping them out. Heritage Foundation. So the Demos wrote the DISCLOSE Act. It severely limits companies from political involvement and many independent groups. Conveniently it protects the unions. They were going to vote on it Friday but they hit a wall. Boss Pelosi was twisting arms and making promises to get the majority she needs. But she let the NRA off - National Rifle Association! Then the fireworks! Hot Air Congress’ attempt to repair their attack on the First Amendment, overturned in the Citizens United decision earlier this year, has run off the rails thanks to the machination of its Democratic backers. Nancy Pelosi pulled the DISCLOSE Act from the House floor last night after the news of sleazy deals to exempt powerful organizations from the law started leaking to the media. Ironically, it was a rare partnership between the NRA and the Democrats that sealed the bill’s fate: Following a rebellion by two important factions of rank-and-file House Democrats, Speaker Nancy Pelosi (D-Calif.) has pulled a campaign-finance bill opposed by a broad coalition of special interest groups, including the U.S. Chamber of Commerce. Pelosi and other Democratic leaders had scheduled a Friday vote on the DISCLOSE Act, a bill requiring special-interest groups to disclose their top donors if they choose to run TV ads or send out mass mailings in the final months of an election. The legislation is designed to roll back the controversial Supreme Court decision in the Citizens United case, which overturned restrictions on corporate campaign activities. But after complaints from the conservative Blue Dogs and the Congressional Black Caucus, Pelosi was forced to pull the bill on Thursday night. Even the opponents of this bill operate more or less in opposition to each other. The CBC took offense to the exception carved out for the NRA, which had objected to the bill’s ability to block their advertising capability. The NRA threatened to launch a full-scale fight against the bill until Pelosi and her lieutenant Chris Van Hollen inserted language that would exempt the NRA from compliance. As KING 5 rolled out one story after another, transportation leaders promised reform and a commitment to cutting costs wherever possible. "What we will look for is every opportunity (to save) because we’ve got to make the system more financially sustainable," said the Director of Ferries, David Moseley last month. But exactly during this time, a strange thing happened to Capt. Pete Williams, the outspoken advocate of saving the ferry system money. Last month Secretary Hammond quietly took away one of Williams’ key responsibilities: representing the state at the bargaining table during union negotiations for the past six years. The union for the captains and mates – the MMP - complained Williams was rude and disrespectful. After that, Williams was out. The decision was made by Transportation Secretary Hammond. "I'm trying to get a respectful table put together so that we don't have people griping at each other, and when they walk in, hostility erupts. I'm not saying that that's what he did, but that's how it was being reported that there's this attitude against each other,” said Hammond. A key negotiator for the state - Ferry Operations Director Steve Rodgers - was blindsided and furious. KING-TV obtained internal e-mails he wrote to Director Moseley. "I stand in complete disagreement with the decision to remove (Pete). It was based on hearsay given to you by an adversarial party with ulterior motives." Rodgers didn’t stop there. In an e-mail sent to Williams, he said, "I have never witnessed anything but professional conduct from you, so I have no idea where or why this surfaces now." In fact, Governor Gregoire herself commended Williams on his expert work in negotiations in the past. She sent Williams a letter in 2006 thanking him for his "professionalism, perseverance, and creativity" in negotiating a union contract back then. Secretary Hammond couldn't come up with any specifics on exactly how Williams has been disrespectful. She admitted to KING 5 that she got input from the union, but didn’t consult with anyone on her own negotiating team. Is this (A) fuzzy thinking by Hammond, (B) unimaginable management or (C) just playing to the unions? Answer: A, B and C. Plus business as usual for the Washington State Ferry bureaucracy. WSF has been found at fault in audit (P-I) after audit, well, the financial audits got better after 21 straight years. But mismanagement continues in not getting more boats built and on the water. ... Meanwhile, some critics were also upset that President Barack Obama and Vice President Joe Biden played a round of golf Saturday near Washington, something they've done on other weekends since the spill. We arrived in Whistler, BC, Canada yesterday for our annual visit. This is our twelfth year spending at least a week here - almost all in the summer. We love the summers here. There is lots to do. All services, including frequent, convenient bus service to other parts of the Whistler Village area. We stay at Creekside on 2/3 of our visits, which is the site of the original gondola and the side of Whistler Mountain where most or all of the alpine skiing events in the 2010 Olympics took place. The finish line of the downhill races and others is literally across the street from Lake Placid Lodge where we stay. Creekside is around the mountain to the south side of Whistler Village. Creekside has a mini-village with stores, restaurants and a Starbucks with a view. But it's small. Much more goes on in the Village about 3 miles away. We ride bikes on the paved Village Trails - a very extensive network that goes everywhere. We take the gondola to the top of Whistler or three chairlifts to the top of Blackcomb Mountain and hike. And hike below. Sometimes we do water sports, though last summer there was no rental of sailboats available; there is canoing and kayaking. There are enough people around that there are festivals and some free live music. 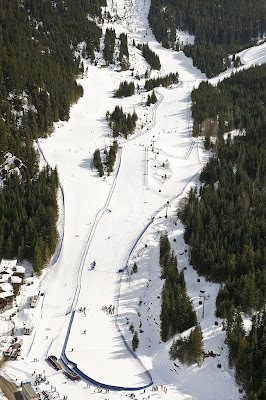 The photo: aerial shot of the bottom of the Dave Murray downhill course at Whistler Creekside. Click the image for a larger version. A federal judge in Washington has dismissed the wrongful-termination lawsuit filed by Gerald Walpin, the AmeriCorps inspector general who was fired last year by President Obama. And not just dismissed; if the decision by U.S. District Judge Richard Roberts stands, in the future the White House will be able fire other inspectors general as it fired Walpin without fear of legal consequences. The law requires the president to give Congress 30 days’ notice, plus an explanation, before firing an inspector general, but Walpin was summarily dismissed by the White House without notice to Congress or explanation on June 10, 2009. At the time, Walpin was aggressively investigating misuse of AmeriCorps money by Sacramento, California mayor Kevin Johnson, a friend and political ally of President Obama. Walpin sued to get his old job back, arguing that he was unlawfully dismissed. Judge Roberts rejected Walpin’s claim by deciding that Walpin was not summarily fired, after all. Even though Walpin was placed on immediate administrative leave on June 10, his authority removed, denied access to his office, email, etc., Roberts says Walpin was not technically fired until later, after the White House had notified Congress. Therefore, the president did not violate the law in ousting Walpin. So Obama can lock out an "independent" IG and prevent him from continuing his work. But he wasn't fired, the judge says, because he was put on paid leave. This grossly violates the purpose of having independent IGs. An independent IG will sometimes find things the "big boss" doesn't like. If he is independent you allow him to do that - to do his job. Obama would not allow Walpin to continue working when he found inconvenient facts. Obama violated the intent of the law and Judge Richard Roberts allowed him to. Big government just got more power. This will hurt all of us as we see our tax dollars going to powerful people who violate the conditions under which they get the grants. The Federal Communications Commission (FCC) voted on Thursday to begin the formal process of bringing the Internet under greater federal control – a move sought by both President Barack Obama and FCC Chairnman Julius Genachowski--even though federal law calls for an Internet "unfettered by Federal or State regulation." This step comes after the federal D.C. Circuit Court of Appeals in April rebuked the FCC in its attempt to enforce a controversial regulatory doctrine called Net Neutrality, which would allow the government to prevent private Internet providers from deciding which applications to allow on their networks. The court said that the FCC did not have the authority to prevent Comcast, specifically, from blocking certain peer-to-peer Web sites. The FCC is now trying to reclassify the Internet to broaden its authority over the Web. Currently, the FCC only has “ancillary” authority, meaning it can regulate Internet access only in the process of regulating another service that it has direct authority over, such as television or cable. The 3-2 party-line vote on Thursday at the FCC began the formal process of reclassifying the Internet as a telecommunications service instead of an information service – its current classification. This is necessary because, as an information service, the government has little power to regulate Internet networks. As a telecommunications service, such as a telephone network, the Internet would fall under a much broader regulatory scope – giving the government the power to enforce universal service requirements, making them pay into a federal universal service fund used to provide communications services to poor areas. While Americans may be eager to vote congressional lawmakers out of office, U.S. companies are pouring money into incumbents’ campaigns. And Democrats are the biggest beneficiaries. Democrats fighting to maintain control of the U.S. House are drawing funds from companies such as AT&T Inc., Boeing Co. and Honeywell International Inc. Their corporate political action committees are among the top donors to 31 Democratic incumbents seen by analysts as the most endangered this year, a review of Federal Election Commission records shows. ... Dallas-based AT&T gave $170,500 and Chicago-based Boeing contributed $95,500, according to FEC records through the first quarter of 2010. Overall, corporate PACs gave $5.2 million to the most vulnerable Democrats, compared with $366,000 to their Republican challengers. ... A Gallup Poll conducted May 24-25 found 60 percent of registered U.S. voters would rather support a House candidate who has never served in Congress, compared with 32 percent who favored a nominee with some congressional experience. That should translate to gains for Republicans, who hold 177 seats in the House and need 218 to take control. 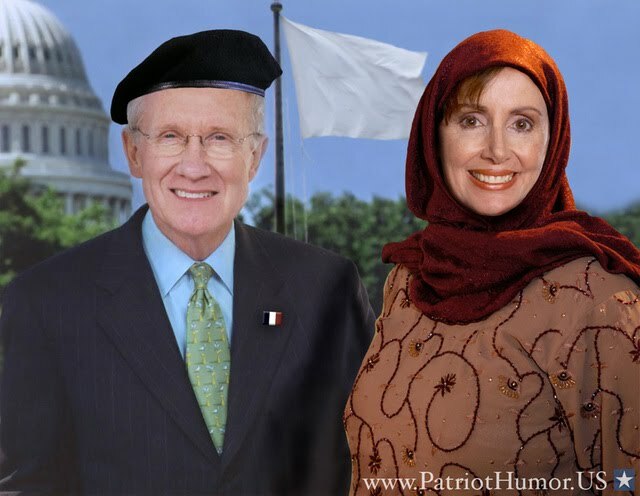 Boeing is so used to playing the "pay to play" game that they give to Dinghy Harry Reid and Boss Pelosi without further thought. They might give directly to them, but every dollar to a Democrat helps them. * The father is reported as Sr., the son as III. It seems there is a missing generation. Or is the father really Jr.? I am investigating combining online maps with data. I am getting into using the basic tools, but that's programming and takes a lot of learning and experimenting. So for a small step I am using a nice tool, Share My Map. Take a look. Then leave a comment either at the map or here. This is a takeoff on USA for Africa: We Are the World, an all-star recording in 1985. This is sung by the "peace activists" who armed themselves with daggers and steel pipes then attacked the IDF soldiers arriving on the Turkish shop two weeks ago. There is some video footage of the attack on the Turkish ship. It's at PJTV. If you like it consider a donation. Albert Gore, Jr., demands full access to the oil spill to reporters - his blog. But he bars reporters from his speeches - 2008 & 2009. You just don't understand why his needs are different. Hat tip to Drudge. I witnessed a five-minute aerial battle Monday, June 14, over Case Inlet, a branch of Puget Sound west of Tacoma, Washington. I was lounging in the bright sunlight (suffering from an allergy attack) looking west across Case Inlet at our cabin on Key Peninsula - Lat/Lon = 47 14' 13" N, 122 49' 33" W. I heard the distinctive call of an osprey, a high, descending, long chirp, then the sound of air rushing over wings! Close in and less than 50 feet high the osprey was flying fast and turning, turning, turning, with a mature bald eagle in hot pursuit. 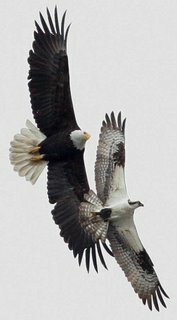 The eagle would rush the osprey, the osprey would turn to avoid him. At first there were also two crows chasing the eagle. The osprey carried a fish in its talons, which is what the eagle wanted; the fish, not the osprey, is the eagle's prey. A mid-air robbery. They moved higher and farther away, as I wondered how this would end. 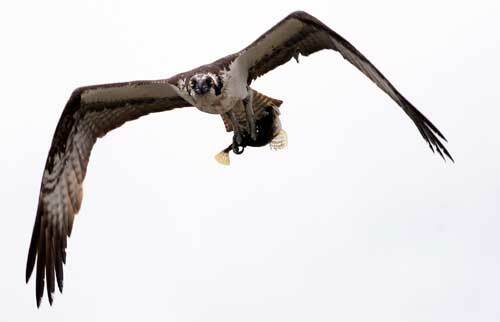 I remembered to watch for the osprey's captured fish to drop and be grabbed by the eagle or hit the water. I didn't see that happen. It was a long battle; I am sure I saw four or five minutes of it. The eagle could accelerate to much faster than the osprey was flying, but the speed worked against him, because when the osprey turned the eagle would overshoot and be far off. After that long five-minute chase the eagle broke off and flew past me below 100 feet and descending. I saw the same battle between a bald eagle and osprey last summer, but it was much shorter. There are resident bald eagles in our area and the ospreys are summer residents. Photos from Everett Herald newspaper. ACORN’s radical allies are now attempting to rewrite history to cast the organized crime syndicate as victim instead of as the prolific victimizer that it has been ever since it was created in 1970. ACORN online campaign director Nathan Henderson-James served notice in February that a propaganda effort was about to begin. “[T]here will be a fight over the narrative of ACORN’s demise,” he wrote to members of Townhouse, a discussion forum run by Matt Stoller, senior policy adviser to Rep. Alan Grayson (D-Fla.). The other side wants “a narrative about the corruption of popular organizations and how they are simply vehicles for the personal enrichment and power fantasies of their top staff members while pushing public policies that destroy middle America.” Such a narrative must be fought, Henderson-James argued, because it “gives people pushing a pro-corporate agenda a way to tar progressives and even non-progressive Democrats running for office with the ACORN brush.” The effort was already underway when Henderson-James reached out to the leftist community. After ACORN’s national board expelled ACORN founder Wade Rathke for engineering an eight-year cover-up of a million dollar embezzlement, Rathke wrote a combination political memoir/manifesto called Citizen Wealth. More recently, Seeds of Change, an institutional hagiography of ACORN by true believer John Atlas was published. And now comes the “Cry Wolf” Project, a push to encourage academics to help spread more lies about the corrupt group. Heading the push is Peter Dreier, a politics professor and director of the urban and environmental policy program at Occidental College, alma mater of America’s Community Organizer-in-Chief. For some real, detailed history - History Commons. President Obama urged reluctant lawmakers Saturday to quickly approve nearly $50 billion in emergency aid to state and local governments, saying the money is needed to avoid "massive layoffs of teachers, police and firefighters" and to support the still-fragile economic recovery. In a letter to congressional leaders, Obama defended last year's huge economic stimulus package, saying it helped break the economy's free fall, but argued that more spending is urgent and unavoidable. "We must take these emergency measures," he wrote in an appeal aimed primarily at members of his own party. The letter comes as rising concern about the national debt is undermining congressional support for additional spending to bolster the economy. Many economists say more spending could help bring down persistently high unemployment, but with Republicans making an issue of the record deficits run up during the recession, many Democratic lawmakers are eager to turn off the stimulus tap. "I think there is spending fatigue," House Majority Leader Steny H. Hoyer (D-Md.) said recently. "It's tough in both houses to get votes." Don't feel bad about not reading the 1500 page bill, Congressmen and senators don't have time to read them. Bill Thomas, a former congressman now leading a deficit-reduction special commission, told Warren Buffett June 2. Congress's ratings by the public are at all-time lows. More devastating news today from Rasmussen Reports for the FTC's "Reinventing Journalism" project, as fully 85 percent of the respondents to a national telephone survey say protecting freedom of the press is more important than saving existing newspapers. Perhaps even more worrisome for the FTC is the fact that only 19 percent of the respondents think it's appropriate for the government to be involved in efforts to prop up existing newspapers, according to Rasmussen. The FTC's "Reinventing Journalism" project is only at the staff discussion level for now, but there is clearly an effort supported by President Obama to mount some kind of bailout for the newspaper industry similar to those previously conducted by the administration in taking over GM and Chrysler, as well as multiple Wall Street firms, most of the mortgage industry and key elements of the insurance industry. See also my column from last week warning my colleagues in the journalism world that there is no way the federal government can be involved in funding or otherwise "saving" newspapers that won't eventually result in major media outlets becoming tools of government propaganda. Claims by FTC officials and their supporters in the media and academic communities that government aid won't lead to government control of news reporting face an uphill battle with the public, according to Rasmussen, too: "Sixty-four percent (64%) of adults say it is at least somewhat likely that if the government provides funding for newspapers to hire journalists, the government will then place limits on what those journalists can cover. That includes 41% who believe it is Very Likely." 6/11/10: I added the link to Tapscott's story. Guess who gets the better grade on basic literacy in economics - liberals or conservatives? WSJ Who is better informed about the policy choices facing the country—liberals, conservatives or libertarians? According to a Zogby International survey that I write about in the May issue of Econ Journal Watch, the answer is unequivocal: The left flunks Econ 101. Zogby researcher Zeljka Buturovic and I considered the 4,835 respondents' (all American adults) answers to eight survey questions about basic economics. We also asked the respondents about their political leanings: progressive/very liberal; liberal; moderate; conservative; very conservative; and libertarian. Rather than focusing on whether respondents answered a question correctly, we instead looked at whether they answered incorrectly. A response was counted as incorrect only if it was flatly unenlightened. Consider one of the economic propositions in the December 2008 poll: "Restrictions on housing development make housing less affordable." People were asked if they: 1) strongly agree; 2) somewhat agree; 3) somewhat disagree; 4) strongly disagree; 5) are not sure. Basic economics acknowledges that whatever redeeming features a restriction may have, it increases the cost of production and exchange, making goods and services less affordable. There may be exceptions to the general case, but they would be atypical. Therefore, we counted as incorrect responses of "somewhat disagree" and "strongly disagree." This treatment gives leeway for those who think the question is ambiguous or half right and half wrong. They would likely answer "not sure," which we do not count as incorrect. In this case, percentage of conservatives answering incorrectly was 22.3%, very conservatives 17.6% and libertarians 15.7%. But the percentage of progressive/very liberals answering incorrectly was 67.6% and liberals 60.1%. The pattern was not an anomaly. The other questions were: 1) Mandatory licensing of professional services increases the prices of those services (unenlightened answer: disagree). 2) Overall, the standard of living is higher today than it was 30 years ago (unenlightened answer: disagree). 3) Rent control leads to housing shortages (unenlightened answer: disagree). 4) A company with the largest market share is a monopoly (unenlightened answer: agree). 5) Third World workers working for American companies overseas are being exploited (unenlightened answer: agree). 6) Free trade leads to unemployment (unenlightened answer: agree). 7) Minimum wage laws raise unemployment (unenlightened answer: disagree). How did the six ideological groups do overall? Here they are, best to worst, with an average number of incorrect responses from 0 to 8: Very conservative, 1.30; Libertarian, 1.38; Conservative, 1.67; Moderate, 3.67; Liberal, 4.69; Progressive/very liberal, 5.26. Americans in the first three categories do reasonably well. But the left has trouble squaring economic thinking with their political psychology, morals and aesthetics. To be sure, none of the eight questions specifically challenge the political sensibilities of conservatives and libertarians. Still, not all of the eight questions are tied directly to left-wing concerns about inequality and redistribution. In particular, the questions about mandatory licensing, the standard of living, the definition of monopoly, and free trade do not specifically challenge leftist sensibilities. Yet on every question the left did much worse. On the monopoly question, the portion of progressive/very liberals answering incorrectly (31%) was more than twice that of conservatives (13%) and more than four times that of libertarians (7%). On the question about living standards, the portion of progressive/very liberals answering incorrectly (61%) was more than four times that of conservatives (13%) and almost three times that of libertarians (21%). ... Mr. Klein is a professor of economics at George Mason University. This op-ed is based on an article published in the May 2010 issue of the journal he edits, Econ Journal Watch, a project sponsored by the American Institute for Economic Research. Thanks to Rick for type reading. Can't reform higher ed. It's too rich and entrenched. So let it sit fat and happy (for a while) and watch the sharp students go around it. But... but... but... that will hurt higher ed. They had it coming; they invited the end run by avoiding reality. It's a story of an industry that may sound familiar. The buyers think what they're buying will appreciate in value, making them rich in the future. The product grows more and more elaborate, and more and more expensive, but the expense is offset by cheap credit provided by sellers eager to encourage buyers to buy. Buyers see that everyone else is taking on mounds of debt, and so are more comfortable when they do so themselves; besides, for a generation, the value of what they're buying has gone up steadily. What could go wrong? Everything continues smoothly until, at some point, it doesn't. Yes, this sounds like the housing bubble, but I'm afraid it's also sounding a lot like a still-inflating higher education bubble. And despite (or because of) the fact that my day job involves higher education, I think it's better for us to face up to what's going on before the bubble bursts messily. College has gotten a lot more expensive. A recent Money magazine report notes: "After adjusting for financial aid, the amount families pay for college has skyrocketed 439 percent since 1982. ... Normal supply and demand can't begin to explain cost increases of this magnitude." He works in higher ed, but recognizes it is impossibly difficult to reform it. 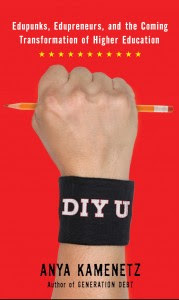 So he points to a chronicler of the alternatives, DIY U, a book. Head of the Immigration and Customs Enforcement to push for an actual physical fence on the Mexico border to stop illegal immigrants and to end the "anointed incumbent...Boxer's obsessive talk of amnesty, sorry, 'a path to citizenship'" that actually acts as a powerful lure for even more illegal immigrants. --Second, Kaus kindly offers, Obama could put him on the National Labor Relations Board so he could thwart "Big Labor's attempt to add to their dwindling memberships by avoiding secret ballots in union organizing drives." --Finally, Kaus offered to accept an administration job offer to the Department of Education to write "a scathing report" on California teachers' unions and their deleterious impact on the state. We're here to mark that day in history when the Allied armies joined in battle to reclaim this continent to liberty. For four long years, much of Europe had been under a terrible shadow. Free nations had fallen, Jews cried out in the camps, millions cried out for liberation. Europe was enslaved, and the world prayed for its rescue. Here, in Normandy, the rescue began. Here, the Allies stood and fought against tyranny, in a giant undertaking unparalleled in human history. We stand on a lonely, windswept point on the northern shore of France. The air is soft, but forty years ago at this moment, the air was dense with smoke and the cries of men, and the air was filled with the crack of rifle fire and the roar of cannon. At dawn, on the morning of the 6th of June, 1944, 225 Rangers jumped off the British landing craft and ran to the bottom of these cliffs. Their mission was one of the most difficult and daring of the invasion: to climb these sheer and desolate cliffs and take out the enemy guns. The Allies had been told that some of the mightiest of these guns were here, and they would be trained on the beaches to stop the Allied advance. The Rangers looked up and saw the enemy soldiers at the edge of the cliffs, shooting down at them with machine guns and throwing grenades. And the American Rangers began to climb. They shot rope ladders over the face of these cliffs and began to pull themselves up. When one Ranger fell, another would take his place. When one rope was cut, a Ranger would grab another and begin his climb again. They climbed, shot back, and held their footing. Soon, one by one, the Rangers pulled themselves over the top, and in seizing the firm land at the top of these cliffs, they began to seize back the continent of Europe. Two hundred and twenty-five came here. After two days of fighting, only ninety could still bear arms. Behind me is a memorial that symbolizes the Ranger daggers that were thrust into the top of these cliffs. And before me are the men who put them here. These are the boys of Pointe du Hoc. These are the men who took the cliffs. These are the champions who helped free a continent. These are the heroes who helped end a war. Sometimes the stone that the builders rejected ends up as the cornerstone of the whole building. That may not quite describe the role of Christianity in American foreign policy, but in some important and little understood ways the massive surge of Christian faith in the developing world is tilting the global playing field in America’s favor. At home, the appeal and the vigor of African-American Christianity, especially of the Pentecostal variety, may be America’s best defense against a sharp increase in home-grown terror. ... Rather than take its lumps and compete, UPS' answer now is to team up with the International Brotherhood of Teamsters to hobble its competitors with the same costly baggage that UPS itself unsuccessfully sought to shed. This is not an academic problem. FedEx has informed Boeing that it will cancel its order for 15 Boeing 777 aircraft if H.R. 915 is passed with this provision. Offline - I spent two plus days at our cabin. But the neighbor didn't have their WiFi on, so I had no internet access. Well, I just had the At&T Edge network on my iPhone. But I don't have a setup to post using that combination. Why does CBS blame Israel for the blockade when it is describing Egypt building a wall plus underground barrier? Does the Muslim world love the Palestinians? If so, why don't they allow access to Gaza through Egypt? Hat tip to Brian Suits on radio KVI.